I'm on call for this weekend, and as long as there's no patient calling me, I've got some time to play... 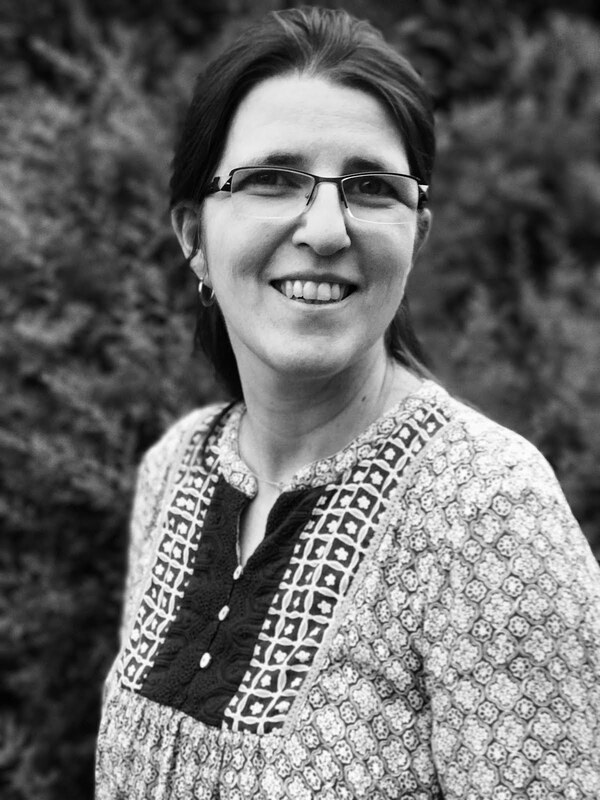 There's a brandnew Challenge Site by my wonderful blogging friend Sankari and her friend Brooke who both love movies: Cinema Saturday Creative Challenge. You HAVE to check out this challenge! Unfortunately, I didn't have the time to play along with the challenge "Pride and Prejudice" last weekend, but how could I resist today's challenge "Breakfast at Tiffany's"?!? So... What is my association with Breakfast at Tiffany's? Diamonds, glitter and bling, of course! So I decided to create a REALLY glittery card...and I added a lacy glitter tutorial to let you know how I created the glittery paper I used. Okay, let's start with the hint that you should close all your windows before working with this technique...otherwise there'll be glitter everywhere in the room, LOL! 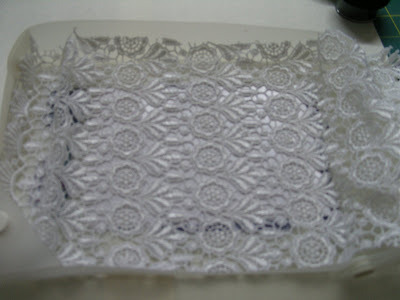 First, peel off the protecting foil from the label and attach the lace onto the label. 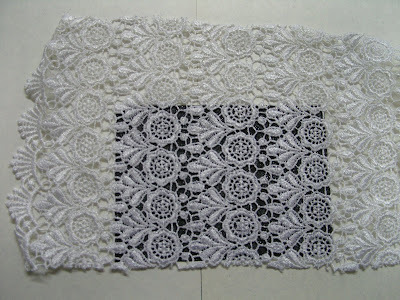 It is important to press it firmly down, otherwise glitter will find its way under the lace and you won't get clear lace designs with your glitter. 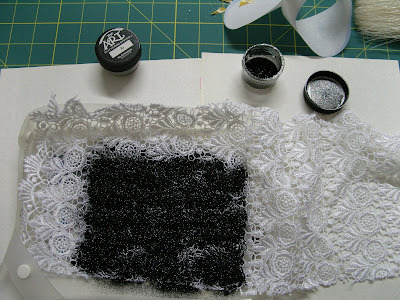 The next step is to pour glitter over the whole piece of lace. 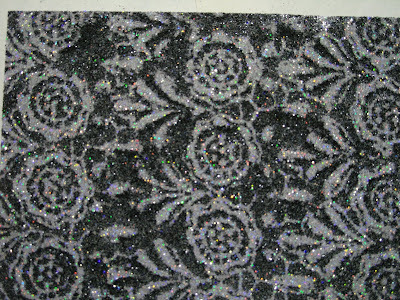 The glitter will stick to the label in the lace pattern's open spaces. Gently tap off the loose glitter... and don't laugh, cough or sneeze now! LOL! 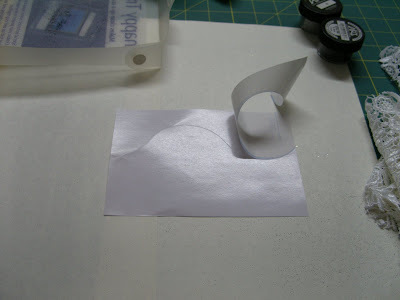 Pour glitter in a contrasting color over the label. It will fill in all free spaces - they are still sticky. 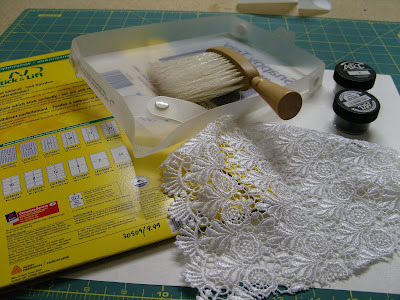 Again, gently tap off the glitter excess - you should have a wonderful glittery lace pattern on your label. 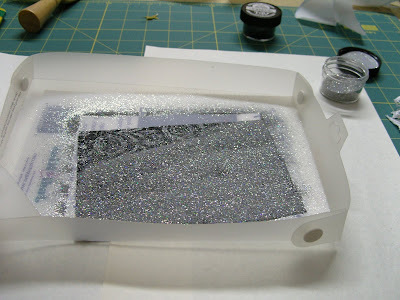 I usually press the glitter onto the label firmly with the protecting foil I kept from my label and use a fixative, but you don't need to do this necessarily. Can you imagine how glittery this piece is in real life?!!! 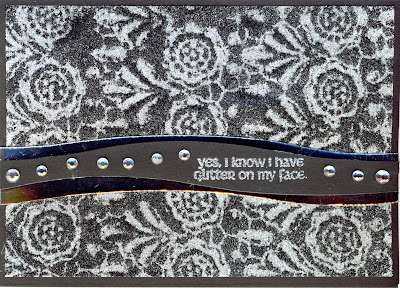 I attached my glittery label to a black card, then just added two curved stripes of black and silver mirror cardstock and some rhinestones to finish my Breakfast at Tiffany's card. 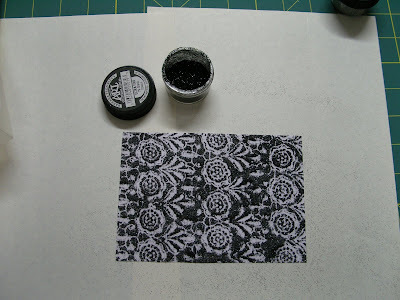 Oh, and I couldn't resist to use this little stamp from River City (of course, using silver sparkling embossing powder)... YES, I KNOW I HAVE GLITTER ON MY FACE! Okay, maybe this sentiment doesn't really catch the emotional part of the movie, but at least I got the glitz!!! Thanks to Sankari and Brooke for this inspirational challenge! Wow what a great tutorial Christiane!!! 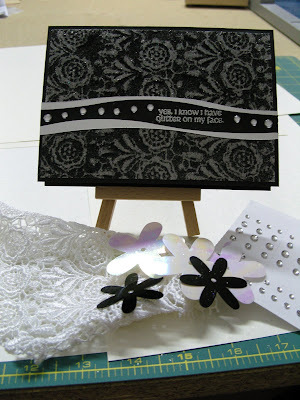 Your glittery tutorial is beautiful - and your card is just beautiful! love the waves with the sentiment in the middle surrounded and adorned by pearls - that sentiment totally makes me laugh - there have been many times that I have gone grocery shopping and someone has pointed out that there is glitter on my face :) great stamp! What a great "audrey" card! Thank you so much for playing!!! 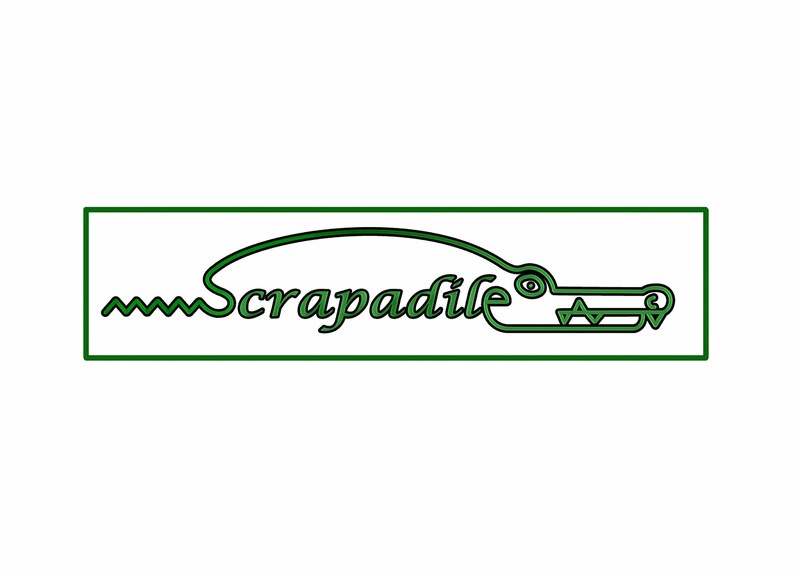 Its always a pleasure to surf over to your blog and see your beautiful creations! I hope your DH is feeling better and that you are getting a weekend to rest and enjoy! and that you get lots of stamp therapy in too!! Thanks for the great tutorial!! That lace so fits the challenge! I'm so glad you played along.. It will be fun to get to know you more..
First, your card is fabulous! Second, thanks for the tutorial, I've seen others, but yours is so much easier to follow. Thanks! wow!!! great tutorial! it so very cute!! !